Every month, members of the Canadian Beauty Bloggers vote for a brand and theme of the month. This month, Colourpop was the brand that was chosen. I decided I would split my collection of Colourpop into 3 posts, with a focus on Part 1 being the Super Shock Shadows, Part 2 will be Lippie Stix and Part 3 will be liquid lipsticks. 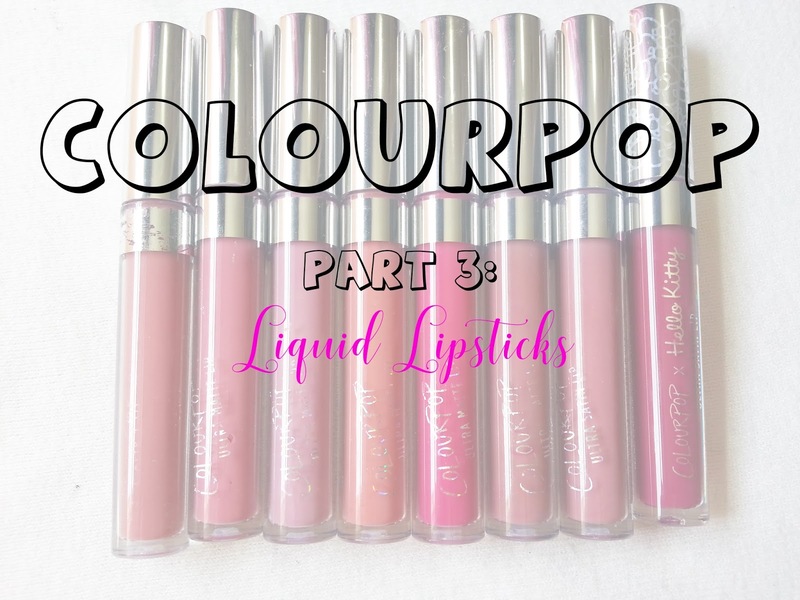 So without going on too much, let's take a look at what Colourpop liquid lipsticks I have in my collection! 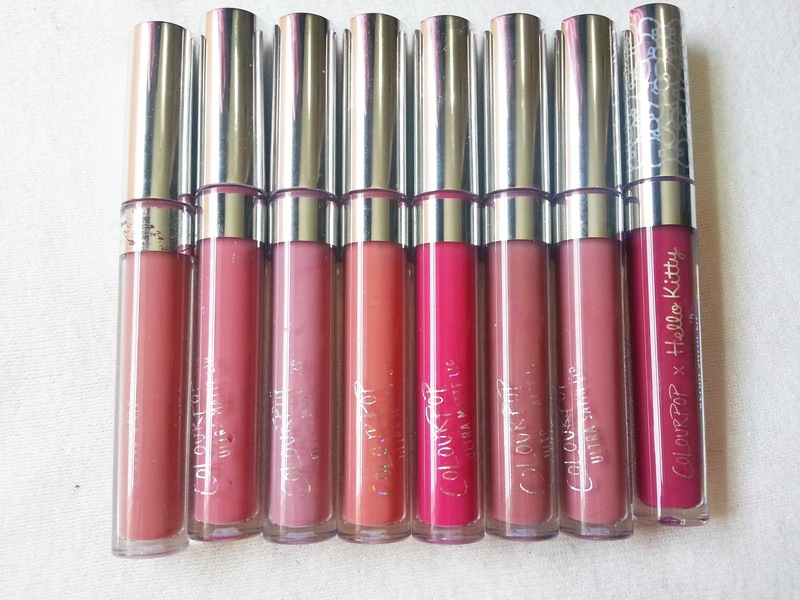 Colourpop's liquid lipsticks also come a large variety of colours and finishes. We have blues, pinks, browns. In finishes like matte, metallic, glossy and satin. When I found out they were only $6 USD, I thought it was a perfect opportunity to finally try liquid lipsticks. This was back in 2015. They come in just an average tube, with a standard doe foot applicator. I will say the writing is easily scratched off, but they do have a sticker on the bottom with the shade name. 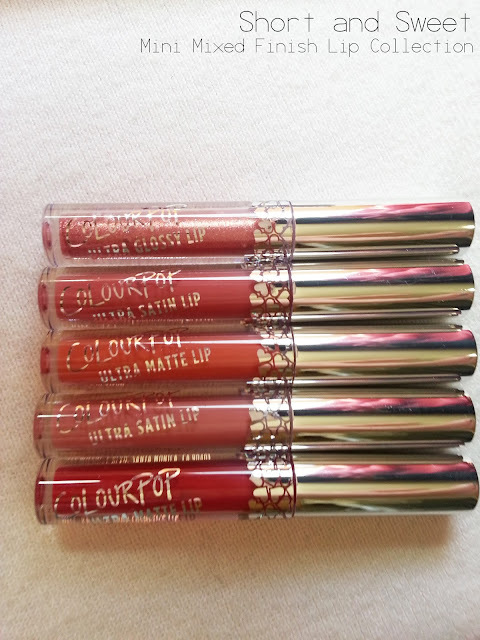 My most used liquid lipsticks from Colourpop are in Solow and Clueless. 1st Base is pretty too! 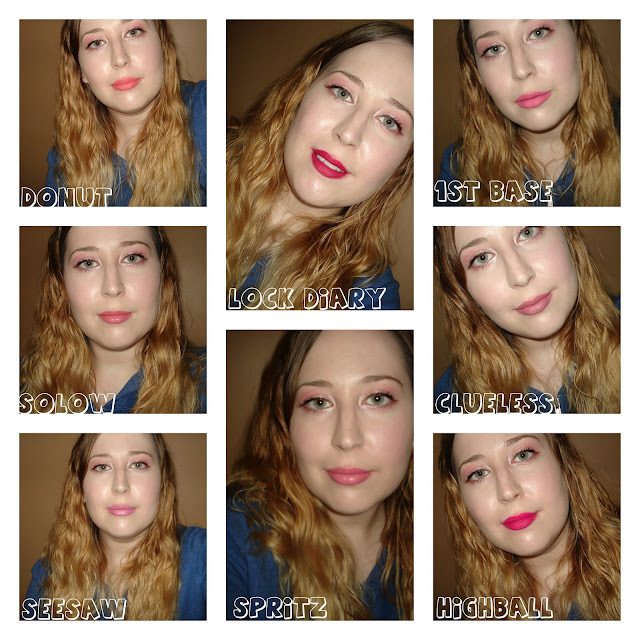 I will say the ones that are closer to your lip colour fade nicely throughout the day, however something like highball, donut, or lock diary, would have a lot more noticeable fading. I also tend to stick to the matte liquid lipsticks because I don't like how their satin finishes transfer and never fully dry down. 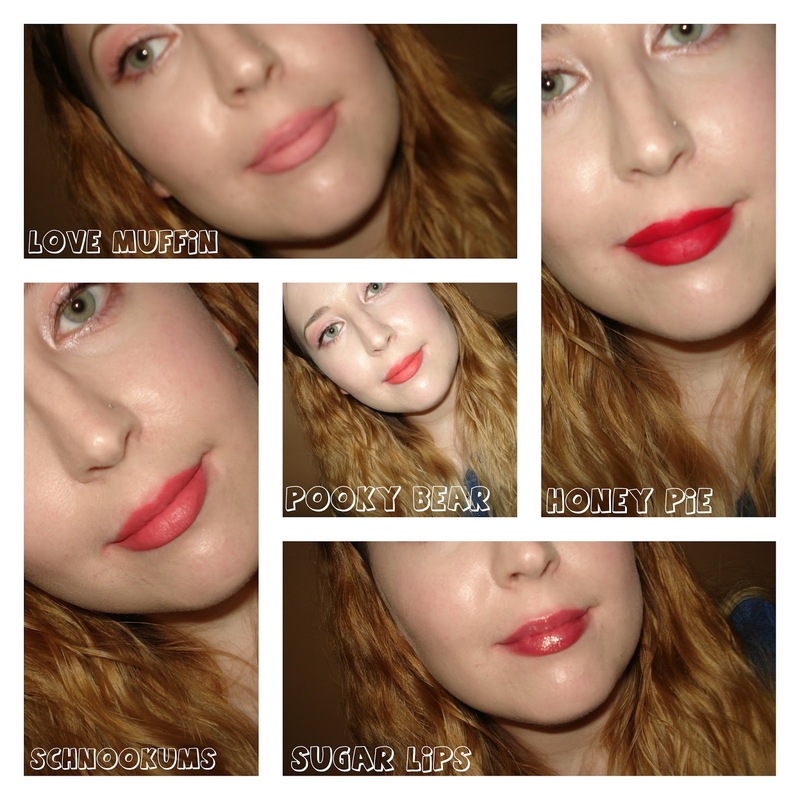 The Lippie Stix primer is great to apply before wearing their matte liquid lipsticks. 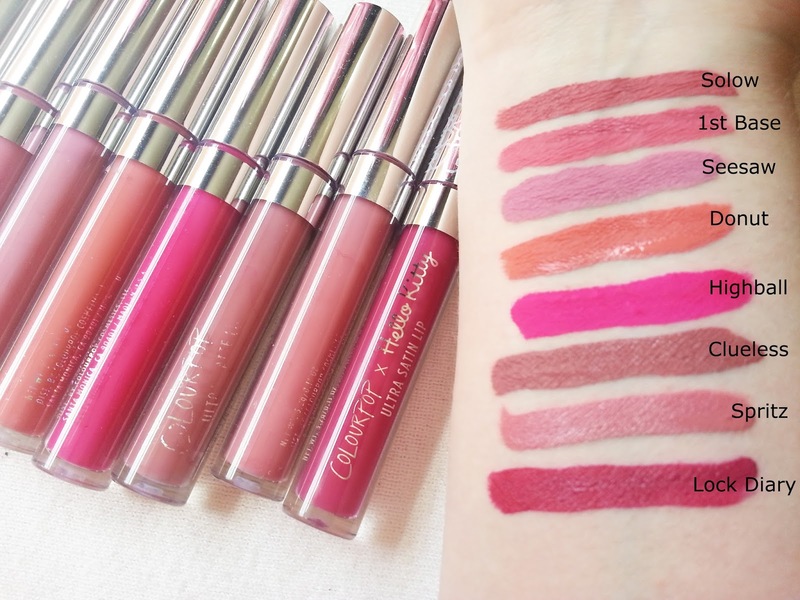 I don't know how some of you bloggers do so many lip swatches in videos or blogs. My lips were hurting after constantly putting on the lipsticks and removing them! But anyway! With all of these lip swatches of the liquid lipsticks, I was wearing the Colourpop lippie stix primer underneath. Clueless and Solow are my two most used out of my collection, and I just find them the most flattering to my skin tone. I will probably be getting rid of Donut and Seesaw because they are just colours I don't reach for and I don't like how they look on me. Spritz is also a colour I need to reach for more because I really like the colour of it! I just wish that it was in an Ultra Matte shade instead of Ultra Satin because I dislike how they never dry down. 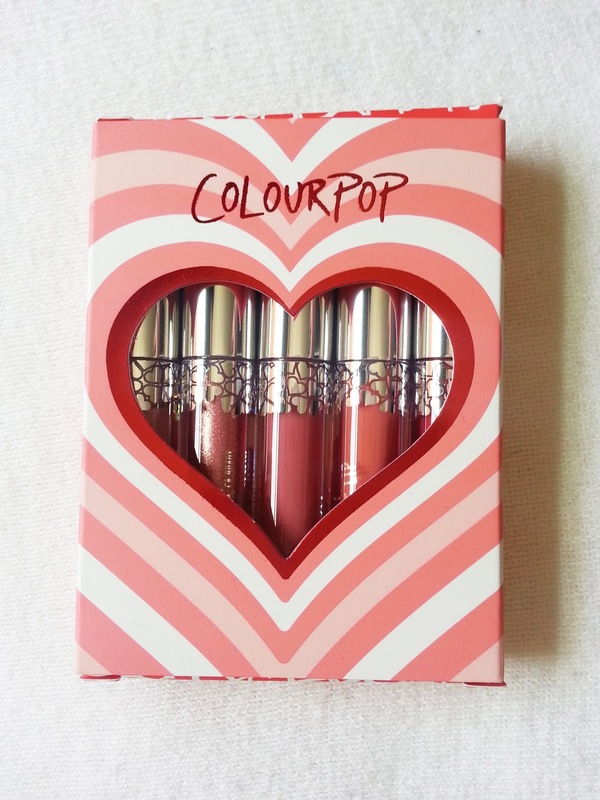 I also recently purchased this mini set of liquid lipsticks from Colourpop! They came in a little box, and the back tells us the shade names and what type of finishes they are. 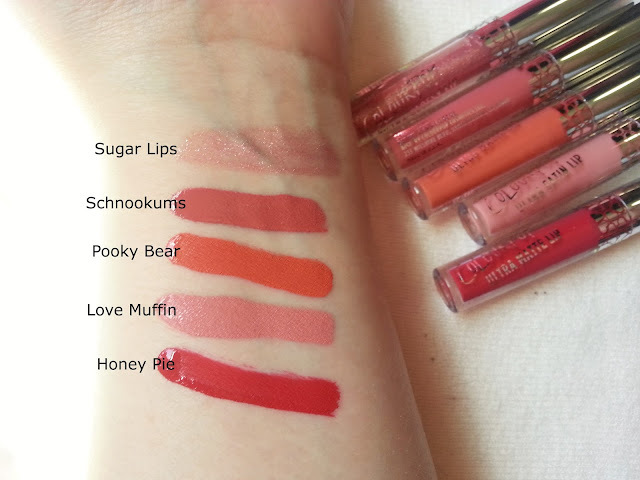 This "Short and Sweet" mini mixed finish lip collection sells for $18 USD. I have to say, I'm not overly impressed with this collection. Pooky bear is too orange on me, love muffin just looks sickly. Schnookums is a decent colour for me, and I will have to play around with honey pie. Sugar lips is a very clear gloss with lots of glitter. Luckily, it isn't sticky.